This section looks at the toys themselves, organised by series. From each page on a particular toy, all information from other sections of this site has been linked as well. Please use the detailed menu at left to see the different series. Pictures include as many loose variations as I could find or request friends to photograph for me. In a few cases, there are variations on cards in the packaging section that do not appear loose in this toy section. And in the case of some of the rarer toys, two views of the same vehicle may have been photoshopped together into a single picture. This first range of Spacex/Golden Astronaut toys comprised 15 different smaller vehicles and 3 larger toys. Most of these toys exist in a number of different variations. Both the Nuclear Freighter and Mobile HQ feature a duotone colour scheme which could be inversed. Since all components were moulded in both colours, it follows that an equal number would be made in either colour combination. The yellow plastic used for Spacex toys started off being Lemon Yellow with a slightly greenish tinge. In course of time this colour shifted to a more orangey yellow, which on the Pleasure Cruiser was then replaced with a distinct peach orange. Some transparent parts also exist in different shades or colours. One of the two most noticeable changes happened when a number of vehicles changed colour completely. This must have happened shortly before the Golden Astronaut line became available in 1969, because no vehicles in early colouring have ever been found in Golden Astronaut packaging. Vehicles in late colouring do show up in Spacex packaging, but there is evidence to suggest both colours were produced side-by-side for awhile (see below). One vehicle, the Nuclear Freighter, received an improvement when its dual tails were included in the body top mould, instead of being (extremely fragile) separate components. This must've happened in 1969, because only a very few separate-tailed NF2s have ever appeared that were proven US-issue - one being part of the contents of a Penney set on eBay, one in my GA Super Set (both the Penney set and Super Set can be seen in the Packaging section) and another one on an early GA card with the inner frame. I've never seen any Freighters with separately-moulded tails on the later GA cards without the frame. Initially, none of the smaller toys bore a trademark of any kind, having only the text "Made in Hong Kong" moulded in. Later on, a Triang Spacex trademark was added to many of the moulds. This must've been a continuing process which I would tentatively put as happening in 1969 through early 1970. Early enough for a NF2 with separate tails to receive a trademark, and for some toys only happening after the colour change because I have Forklift 7/Lift Loader both in early (orange) and late (blue) colours with and without trademarks (thereby proving that both colours must've been produced side-by-side for awhile). The three large toys appear to have carried Spacex trademarks from the start. The final possible variation is that certain vehicles received a new name for the Golden Astronaut version. Some of the name changes made commercial sense, replacing rather prosaic British names with more dynamic-sounding ones. But some other changes are more puzzling, for example the name swap between the Explorer and Prospector vehicles. Judging by what has survived on original blister cards, Spacex toys retained their original name even if they had new colours. of varying size depending on the model. As a final point, it's sad to say quality control wasn't 100% in Spacex production. A careful look through the pictures on this site will reveal a few flawed toys here and there, some still on card through remaining unsold due to the more obvious amongst the defects. Spacex by Pippin is the revised range of the original 18 Spacex Stage One models with four new vehicles added. It remains a mystery why these four vehicles were added to the original line-up instead of included with the Pippin Spacex II series, produced at the same time. The Spacex II series brought another 11 new vehicles to the range. These were available from early 1970, followed a few months later by the larger Photonic Space Station, Apollo & LEM and Soyuz 6 & 7. 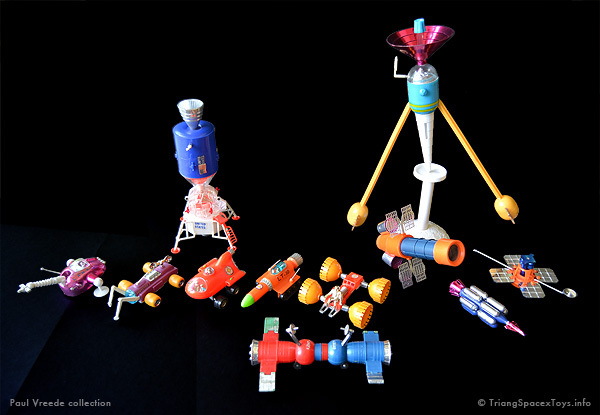 Judging by the dates found on British registered design applications for these toys however, it appears the larger toys were still developed concurrently with the smaller ones. These dates span December 1969 to February 1970; the applications apparently being made as soon as a (pre-production) model was available to be photographed. Although for three of these vehicles no single example has surfaced (so far), there is no reason to assume some of them may not have been produced. All were advertised, in consumer or trade adverts or both, long before Triang went under in August 1971. Not having a box, I don't know in which themed series the Soyuz 6 & 7 would belong. 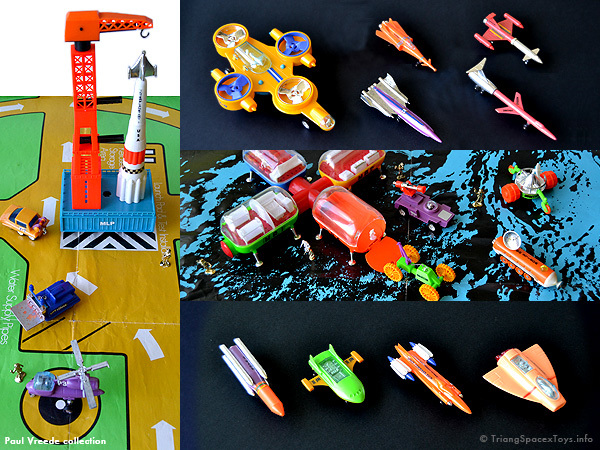 But I suspect they're in the Earth Launch theme (and thus would have a box in orange), because in real life these craft never reached the Moon or explored outer space. And it would also mean that each theme would then have a larger toy as in the Stage 1 series. In the US, four of the later vehicles were added to the Golden Astronaut range. The packaging on these doesn't mention any other individual models or extended series, and only these four were advertised in the 1970 Multiple Toymakers catalogue, which would prove that those four were indeed the only ones to reach the States. A number of the Pippin Spacex vehicles feature coloured chrome plated parts in which minor variations are possible. To obtain these bright shiny colours, plated parts were painted in blue or red varnish (similar to the astronaut figures getting their golden finish by having a yellow varnish applied over the chrome plating). This may lead to variations in brightness by having more or less varnish applied, or some parts being varnished on one vehicle and left unvarnished on the next (see Orbiter Satellite as example). I initially thought the variations in varnish were all the variations there were in Pippin Spacex colours. 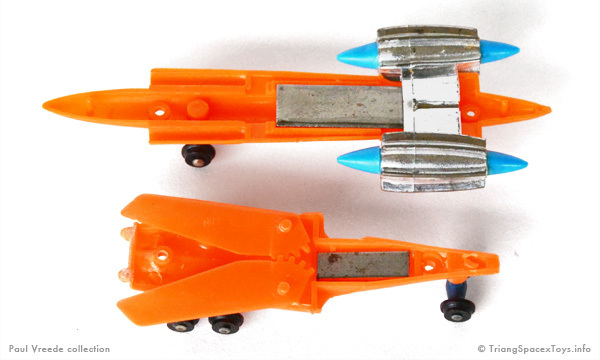 Although the 1970 Multiple Toymakers catalogue shows a Molab in green and an LT10 in blue, I imagined these were just preproduction colours or mockups or such. But then I obtained an Orbiter satellite in blue instead of the usual orange, which does now make me wonder about those vehicles in the catalogue. Perhaps they also were really produced in those colours after all? 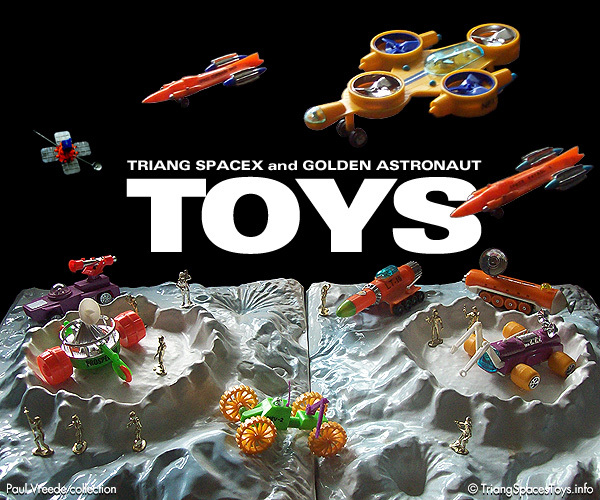 Each vehicle came with a golden astronaut figure, while larger toys and boxed sets had several of these figures included. Badges were included with some Pippin-produced vehicles, while the Golden Astronaut Club offered another to its members. 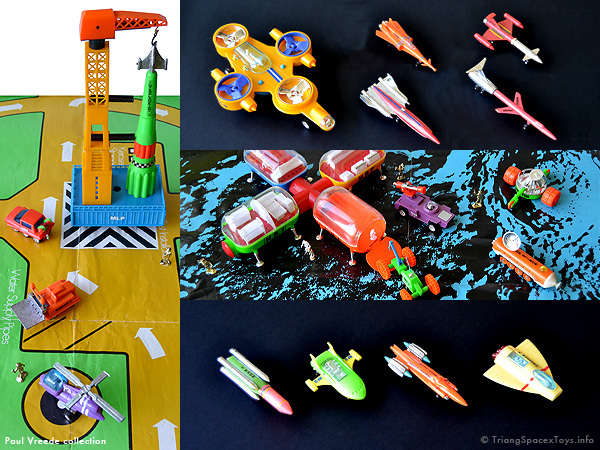 The play surfaces shown have all been found in Spacex boxed sets, except the single item from a Golden Astronaut set. Figures, Spacex badges or play surfaces weren't available separately.